Catholic Bibles: Anybody have this NJB from DLT? It is the NJB Standard Edition Leather from Darton, Longman, and Todd in the UK. Is it hardcover leather, like many of Bibles produced by Baronius? The New Jerusalem Bible is recognised as one of today’s most accurate, clear and modern translations, the fruit of long collaboration between leading biblical scholars. 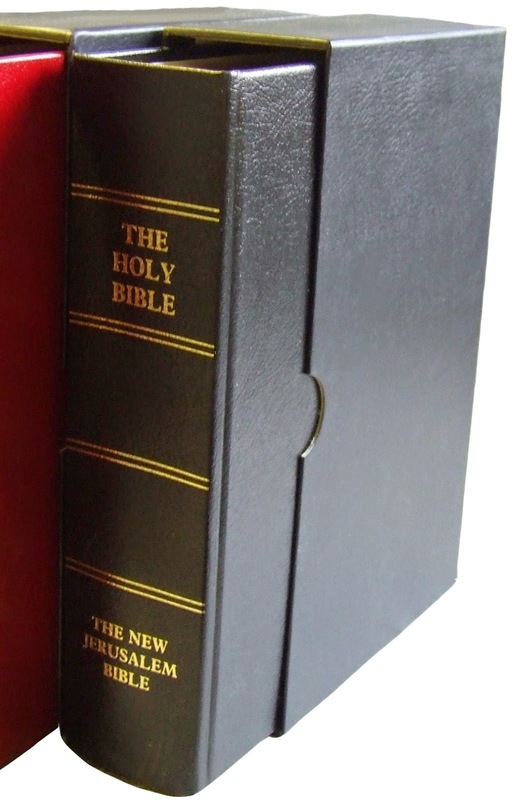 This Standard Edition - bound in black leather on board, golden gilt page edges, head/tail bands with two ribbons and presented in a sturdy protective slipcase - presents the New Jerusalem Bible with comprehensive material designed for serious study of the scriptures. That's how I would read "black leather on board" in the description. in the past, several years ago my Catholic book store had a couple of these brand new. I got a chance to look threw them. It is a hard cover wrapped leather. I think it had a couple of black ribbon markers. The cost was $125.00, they are nice. Seems like a reasonable price to me, but I wish the original one was still available! The readers edition from DLT is nice, but it has limited notes and cross references. The one that I saw was a deluxe version of the NJB hardcover that is currently available. It had the full notes and cross references and was the same except for the leather wrapped hard cover, the sewn binding, the ribbon marker and the gold gilt page edges. The NJB featured here as well as the Doubleday version, come in single column text format.